Determined to finally escape from under the shadow of her late Shakespearean-actor father, The Great Legaurd, Esti Leguard is ready to prove to everyone (including herself) that she has what it takes. She's given a chance at a fresh start when she and her mother move to the remote island of Cariba, which features a renown high school acting program. But Esti's plans don't work out as nicely as she had hoped when a boy is found murdered on her first day at school during tryouts for the school play. Quickly the relaxed Carribean atmosphere Esti found so charming at first becomes dark and frightening as rumors of a malevolent spirit, or a jumbee, is thought to be haunting the theater. As Esti tries to navigate the politics of a new high school and the ever-increasing depression of her mother, she finds herself becoming more intrigued and ever closer to the 'voice' she heard the first day of auditions. Introducing himself as Alan, Esti knows she must keep their odd 'relationship' a secret even as Alan offers such wonderful insight into her acting and the poetic words of Shakespeare. As events begin to spiral out of control, Esti longs for more from this friend she has never seen nor touched but someone whom she would go to great lengths to protect. 1. It's a Phantom of the Opera retelling. And I'm totally serious here folks. I really didn't need any other convincing whatsoever to pick up this book. Besides the totally unusual cover (which actually comes directly from the book! yay! ), all I had to read was 'a modern Phantom..' and I was completely lost. OF COURSE I was going to pick up a book that focused on one of my all-time favorite musicals and even though I was (understandably) nervous about the direction Pamela Keyes would take Gaston Leroux's creep-tastic classic, I just knew it was something I couldn't pass by. 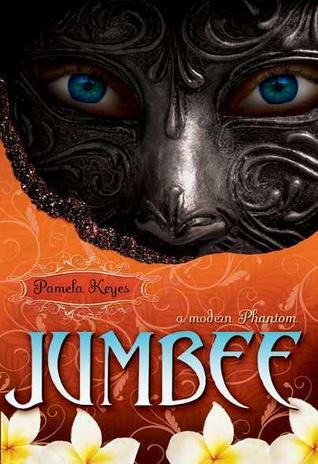 And to be totally honest, I'm so incredibly glad I did read The Jumbee. Aside from my confusion with the whole prestigious-acting-school-in-the-Caribbean thing, The Jumbee was something really extraordinary. Esti is a sympathetic character whose past weighs so heavily upon her, it has basically begun to suffocate her future as well. Enter Alan (our Jumbee, aka The Phantom) who through a series of well-placed Shakespeare quotes and blocking tips, is able to draw out the latent genius residing within Esti. Obviously this girl is going to fall hard for such a mentor, even if that mentor happens to only be a voice she's never once laid eyes on. One of my favorite aspects of the original Leroux story is Christine's fierce loyalty to (or love for) the Phantom - even when everyone around her is convinced she is crazy and that he is a monster. I was so happy to see this theme carried into Pamela Keyes version as I feel it is one of the most defining characteristics of the story. Furthermore, Ms. Keyes does a fabulous job at recreating the mysterious and foreboding atmosphere from Phantom in The Jumbee. I wasn't quite sure how she would pull it off, having her story set in the Caribbean, but all the native superstitions and legends added nicely to Alan and Esti's tale. That said, there were many departures from the original story, such that the author was able to effectively make into her very own that at times I almost forgot I was reading a retelling. Almost. It's pretty hard to do that when you've got a constant Andrew Lloyd Webber soundtrack playing in your head. I hope to finish this tonight. I'm surprised that I've liked it more than I thought.